Galois' short life may have been the most tragic and romantic in the history of mathematics. In contrast to Cauchy, Galois was an ardent republican; he was jailed twice, once for six months, for his radical political views. His major contribution to mathematics is Galois theory which he developed to determine when a polynomial was solvable by radicals (its Galois group is a solvable group); it is ironic that a problem about solving polynomial equations by radicals was solved by a radical. He died at the age of twenty in a duel, and he spent the night before writing a letter to his friend Auguste Chevalier describing his mathematical results and urging Chevalier to see that they received their proper recognition. A number of times in the letter Galois wrote, "I have no time" as though he were a student running short of time on an exam, definitely a final exam. Galois' revolutionary work was very difficult to understand, due to the novelty of its ideas, the complexity of the arguments, and a lack of clarity in its exposition. 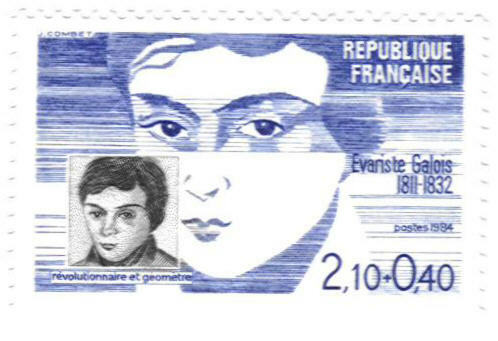 The results were not published until 1846 when they were edited by Liouville and placed in the Journal de Mathematique Pures et Appliquees; after its publication Galois' work gradually became known to mathematicians. It became fundamental to the rise of abstract algebra and exerted a strong influence on modern mathematics in general. Even today Galois theory is difficult to absorb; an abstract algebra student is reported to have said that "Galois theory is like garlic; a little bit goes a long way."